The discovery and development of multifunctional materials, in which more than one property coexist, can enable unprecedented approaches to addressing challenges in healthcare, energy conversion and storage, and environmental stewardship. 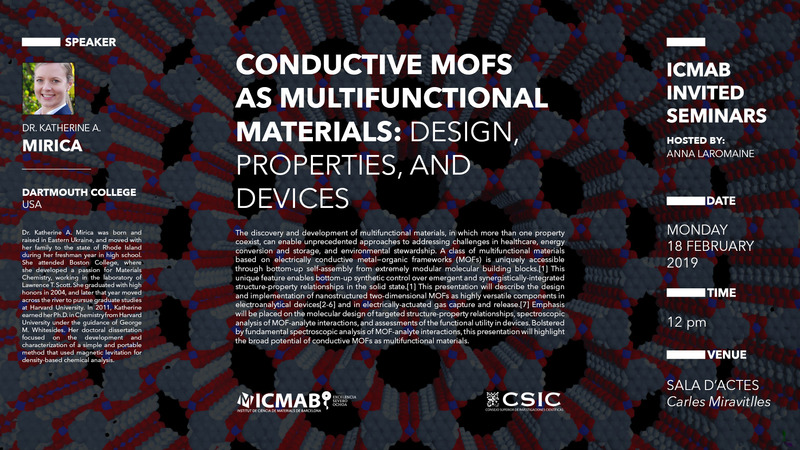 A class of multifunctional materials based on electrically conductive metal−organic frameworks (MOFs) is uniquely accessible through bottom-up self-assembly from extremely modular molecular building blocks. This unique feature enables bottom-up synthetic control over emergent and synergistically-integrated structure-property relationships in the solid state. This presentation will describe the design and implementation of nanostructured two-dimensional MOFs as highly versatile components in electroanalytical devices and in electrically-actuated gas capture and release.Emphasis will be placed on the molecular design of targeted structure-property relationships, spectroscopic analysis of MOF-analyte interactions, and assessments of the functional utility in devices. Bolstered by fundamental spectroscopic analysis of MOF-analyte interactions, this presentation will highlight the broad potential of conductive MOFs as multifunctional materials. Dr. Katherine A. Mirica was born and raised in Eastern Ukraine, and moved with her family to the state of Rhode Island during her freshman year in high school. She attended Boston College, where she developed a passion for Materials Chemistry, working in the laboratory of Lawrence T. Scott. She graduated with high honors in 2004, and later that year moved across the river to pursue graduate studies at Harvard University. In 2011, Katherine earned her Ph.D. in Chemistry from Harvard University under the guidance of George M. Whitesides. Her doctoral dissertation focused on the development and characterization of a simple and portable method that used magnetic levitation for density-based chemical analysis. She also contributed to several other research efforts in the areas of paper-based diagnostics and protein biophysics. Katherine then joined the laboratory of Timothy M. Swager at the Massachusetts Institute of Technology as an NIH postdoctoral fellow to pursue the development of portable electronic carbon-based chemical sensors for the detection of hazardous gases and vapors. At MIT, she developed a solvent-free approach, operationally analogous to drawing with pencil on paper, for the fabrication of sensitive and selective sensors from carbon nanomaterials. Katherine began her independent scientific career as an Assistant Professor in the Department of Chemistry at Dartmouth College in July 2015. She is a recipient of the Army Research Office Young Investigator Award (2017), Sloan Research Fellowship (2018), and 3M Non-Tenured Faculty Award (2018).